Redfish filets - leave out the part thinner than approximately 1/2"
Palm Oil - Bright red, found at international markets. I haven't posted a recipe in a long time, and it was way past time to get a new redfish recipe into the repertoire. This is one is one of my favorite dishes from Brazil, my adopted second home courtesy of marriage. When we visit my wife's family or friends, it's always a treat to get this dish. 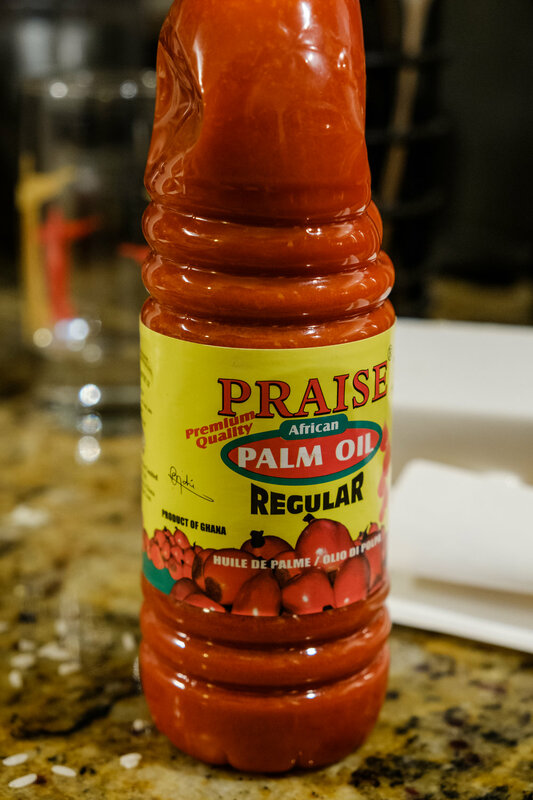 This features palm oil (azeite de dendê), a staple of the Northeast region of Brazil, and the state of Bahia in particular. It is surprisingly pleasant even on hot days, and luckily redfish work great in this recipe, as the meat holds together well. I would venture to guess that it wouldn't work quite as well with something like speckled trout or flounder, which might just disintegrate. It's a pretty quick recipe, and cooking time is only about 30 minutes. It also has a pleasantly short ingredient list, with just a couple of things you might not have around the house, namely palm oil (azeite de dende) and coconut milk. In any case, it should be pretty easy to track those couple of things down, and this is a delicious and quick way to cook your fresh redfish catch, or use frozen fillets. Cut the fish into pieces that are around 2x3" or a little bigger. I like to leave out the thinnest part of the fillet, but don't throw it out - use it for the secondary recipe below, or save it to fry. For this recipe I use two redfish fillets - healthy 24" plus fish. Squeeze some lime juice over the fish and let it sit while finishing the recipe. Slice the tomatoes, onions and bell peppers crosswise, so you get rings out of the peppers and onions. Layer them on top of the fish. Squeeze in some garlic if you'd like, and throw in the chopped cilantro to taste. 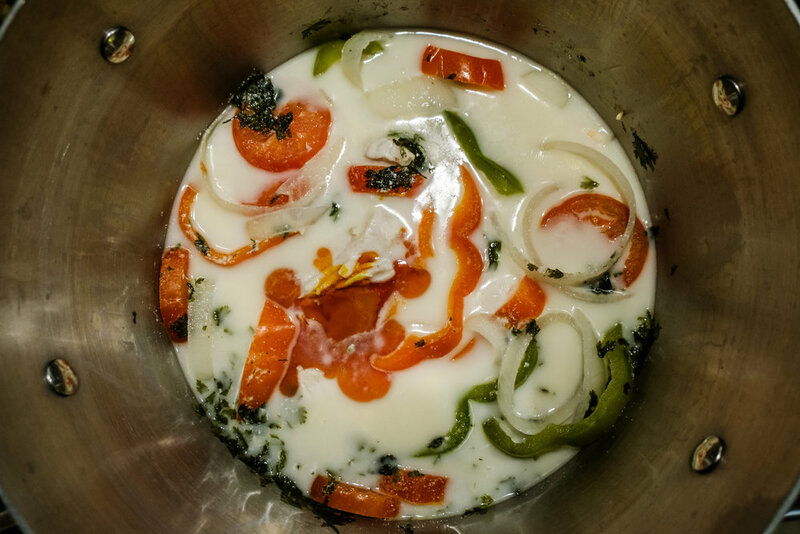 Add the coconut milk, and put the burner on low-med heat with the top of the pot just cracked. Let it cook for about 15 minutes, give it a stir and another 5-10 minutes, and when the bell peppers and onions are good and soft, add the palm oil - about 2 tablespoons, a little at a time. Try not to stir the dish too much, as it will break up the fish. Optional things to add are ground dried shrimp, hot peppers, fresh shrimp/crawfish. That's it! Just make sure the peppers are cooked through so the texture isn't crunchy, and dial in the recipe little by little. Serve over hot rice and with a legitimate hot sauce. Another thing I really enjoy when visiting Brazil is Pirão, which is basically a mash/paste made with fish stock and farinha de mandioca (manioc flour). If you can find manioc/yucca flower at a Latin American market, this is a super thick, filling side dish. In essence, you just set aside some fish stock or extra broth from the moqueca or whatever fish dish you're making, and slowly add the manioc flour, almost like a roux. 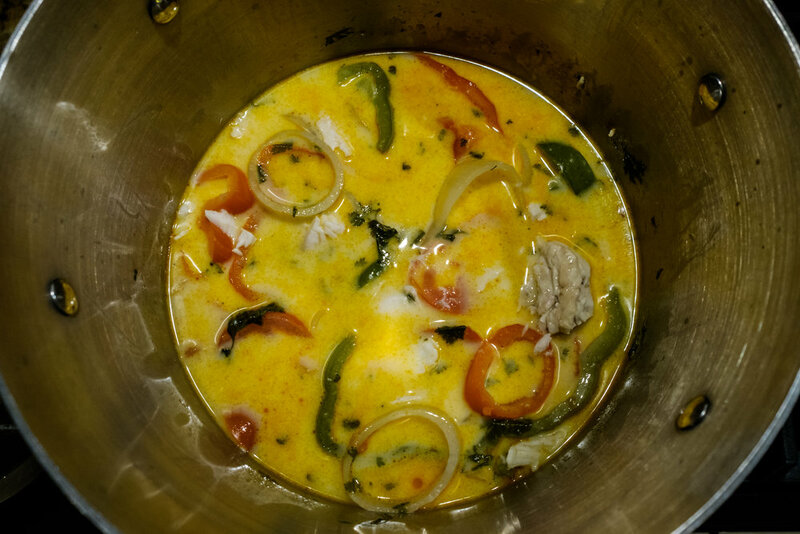 You can use the thin parts of the fillets that you didn't use in the moqueca to add extra fish to it. Salt, hot sauce, and you'll feel like you can climb a mountain, right after your nap. Gotta serve with the heat!!! !